This time of year is filled with self-indulgence as we enjoy the good times of Christmas and New Year! Guilt-free, we celebrate every single moment with our loved ones, family, and friends. With New Year’s Eve on the horizon, let’s not forget the parties and the booze that often accompanies such occasions! Soon enough, however, your body will start to let you know that it could use some fine tuning. You may start to feel sluggish and bloated, break out, and lose your oomph for life. Add to that the post-New Year’s Eve hangover from hell slowing you down even more. Our bodies are designed to engage in detoxification every single day, however from time to time we all need a gentle nudge in the right direction. This is why we love to start each New Year with a clean slate. Detoxes, cleanses, you name it—it is the perfect time to become your healthiest, most authentic self. To start detoxing, you don’t need to commit to weeks of sipping on just green juice. Simply roll out your trusted mat and the yoga poses below will stimulate your circulatory, digestive, and lymphatic systems, helping you rid your body of waste and toxins! In our yoga practice, each new breath is a new moment: you can restart any time, all the time. Pranayama literally means extension of life force or vital energy (breath). Yoga helps you remain in the present, moving forward, never looking back. These poses will leave you feeling spacious and ready to take on 2015 with a renewed zest and passion for life. You can pick out a few yoga poses to detox mildly, or practice them as a sequence any time you need a cleansing. 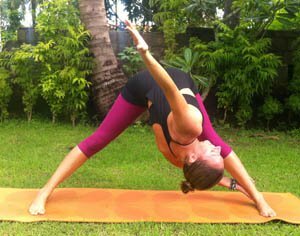 A great pose for opening tight hamstrings, allowing your head to fall below your heart. 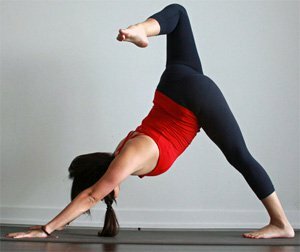 This pose also reverses the pull of gravity, encouraging circulation of blood throughout the body. The folding motion squeezes the belly which also moves things along for digestion. Modification: From a Wide-Legged Forward Bend, take left hand to right ankle or shin, reach right hand toward the ceiling, and lean back, opening your heart to the side of your mat. Breathe for five deep breaths, then repeat on the other side. This kickass pose strengthens your lower legs, and makes your quads and glutes feel as though they’re on fire! This deep twist is also excellent for aiding digestion as you feel the gentle pressure on your kidneys, liver, and spleen that stimulates the removal of toxins, while toning your abdominal wall. It stimulates the heart, improving circulation in the blood, respiratory, and lymphatic systems, and relieves mental and physical sluggishness! Modification: Start in Chair Pose, bringing hands together at heart centre. Take a big inhale to lengthen spine, and exhale to twist to the right, taking left elbow outside of right thigh. Inhale to center and exhale to twist to left. Repeat this sequence five times on each side. This pose stretches and opens the chest, lungs, shoulders, and spine, increasing lung capacity. The revolved motion stimulates abdominal organs, aiding digestion and circulation, releasing stress and anxiety, and energizing the body and mind. 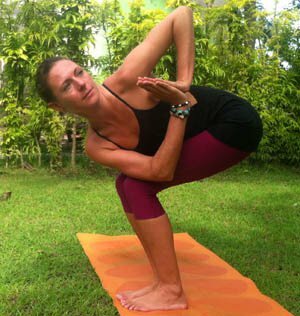 This pose strengthens the entire back of the body, opens the heart, and encourages good posture. The pressure on your abdomen also encourages digestion, which stimulates the release of those things that no longer serve you. Modification: If this pose is uncomfortable, Half Locust is a great alternative. Another pose where your heart is above your head, Bound Headstand strengthens the entire musculoskeletal system, while providing more efficient circulation caused by a fresh delivery of blood to the heart. It stimulates the thyroid glands, which increases metabolism, stimulates the nervous, digestive, and respiratory systems, and releases toxins effectively from the body, not to mention changing your perspective on life by literally turning you upside down! This pose is typically held 10 breaths or longer. Focusing on deep breaths clears out carbon dioxide from the lungs. A twist will not only leave you feeling energized and focused, but will also give you mental clarity, relieve stress and deep tension, and detoxify your entire system by primarily massaging your internal organs, encouraging the elimination of toxins. When you release your twist, fresh blood and nutrients rush back into your digestive organs, helping nourish and support them. Stay in Supine Twist for at least five deep breaths, then repeat on other side. Even better—bring some Yin into your world and hold it for two to three minutes on each side! I hope this sequence will make you feel inspired and motivated to become the happiest, healthiest, most fabulous version of yourself in 2015. Enjoy!